She sells seashells on the sea shore! I always wondered why but now I know it must be for seashell crafts of course. Have you ever entered one of the craft shops at the seaside? They are full of beautiful and clever models and sculptures all made from sea treasure. And treasure it is! See all these shells. Let your imagination run riot! Play around with them and then get the glue gun out. 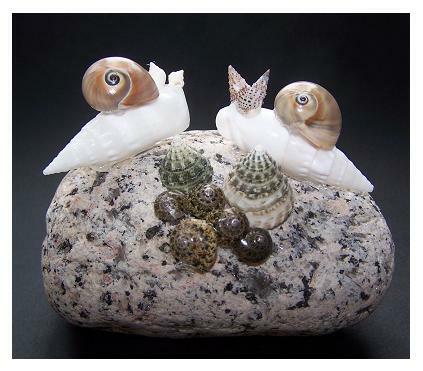 Here are a couple of sculptures that I created with my mollusc collection. They make really attractive homemade ornaments that you can exhibit on your shelf at home. Make a collection of them and impress your friends. Do you have a big bivalve shell? They come plentiful along English beaches. How about decorating it with smaller molluscs and periwinkles. Like a flower arrangement you can make a shell arrangement too. Try placing different shapes inside the larger shell and when you have some kind of design glue them fast with the glue gun. Use taller and larger ones at the back, with the smaller in the front. Look in your collection! Do you have tall shells and tiny ones? Spirals and ones that look like a whipped cream decoration around a cake? Think of what each one looks like. It`s a good idea to sort the shells into groups. Different colors, sizes, and shapes. Because you need to work quick before the glue cools, you need to have worked out where you want to place each of them. I used tweezers with the tiny shells. They can be fiddly to work with. On the beach there are so many interesting stones. They are made of granite, marble, slate and other stone. The colors are beautiful in the water and can be just as beautiful added to a water feature or fountain in your garden. But if you don`t have a water feature, use them in your shell crafts. Painting them with a coat of varnish will brighten up the colors. Look at my sculpture! I named it, "Snails in the Cabbage Patch". I loved making it and it was so simple to do. The stone has an interesting texture and color and the shells look just like snails ready to eat the cabbages. Don`t you think they make nice gifts? The next time you take a trip to the seaside, look for interesting shells and stones that you can use in your next seashell crafts project. 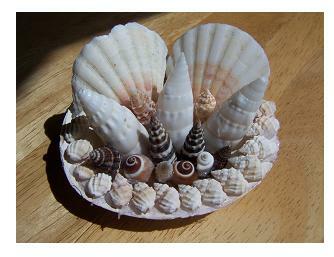 If you don`t get the opportunity to go down to the sea, you can always buy some seashells in a craft shop or on eBay. She sells sea shells on the eBay store! 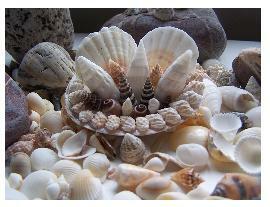 Seashell crafts for kids is a fun way to make use of your beach treasure. Are there other beach crafts you can do too?